Solution for higher resolutions on STE? as the subjet says: I'm looking for any currently available solution for higher resolutions in an STE. It could be internal or external and use current or old (but still available) components. I've read a lot about ET4000 based expansions, but everything I've found so far required the presence of a bus like in an Mega ST(E), TT or Falcon. I'm looking for something specifcially for the 1040STE. Re: Solution for higher resolutions on STE? Higher res on some Atari ST(E) is huge overkill for architecture of machine. Because it is made for then actual RAM speeds, for specific timed bus. That means that you can not make higher res using existing RAM in machine. Or more colors. Card with own RAM is required - as case with ET4000 shows. And then we are at biggest flaw of Atari ST(E) by me - no expansion bus. So, if you want it, you need self to make that expansion bus like in Mega ST. Unfortunately every Atari has different expansion bus. Mega STE complete different than Mega ST.
AtariZoll wrote: Higher res on some Atari ST(E) is huge overkill for architecture of machine. Because it is made for then actual RAM speeds, for specific timed bus. Yes, I know. What I hoped to find was something that either replaces the builtin shifter (like for example VBXE does for the 8Bit-Ataris) or an independant graphics adapter that is solely usable via a driver and comes with its own RAM and acceleration. We had some discussions about this beeing an option for Exxoss new STE accelerator in this thread http://atari-forum.com/viewtopic.php?f=15&t=29868, but it proves to be quite difficult. So I was wondering, if there already is a solution, that some might have successfully implemented. AtariZoll wrote: And then we are at biggest flaw of Atari ST(E) by me - no expansion bus. Yes, I agree this beeing a big flaw. That said, IS it possible to recreate for example the Mega STE's bus, to then connect a ET4000 for example? Looks like "ST modes" were a limiting factor ? But of course it depends on the design goals, if you want to run legacy software (games) in low res, or just abandon ST video modes all together and go with a fixed resolution like 1024x768 which should be standard on most cards. Interesting, so it seems at least to be possible. I found no documentation, but judging by the pictures it would plug in the CPUs DIL-socket, CPU on top. But sadly not available nor open-sourced. exxos wrote: Looks like "ST modes" were a limiting factor ? No, not at all. I'm not much of a gamer, and if it hits me, I'm perfectly fine with stock resolutions and -colours. My personal goal is just having more screen estate for desktop and applications however limited the use would be. In addition I really like the ST's highres-mode, I find this very productive and mostly use my STE that way. So something I would like to have is 1024x768x1BP, which would only require 96KB RAM. This should performance-wise not be too demanding. Of course to show-off, higher bitdepths would be cool, and with a booster it might be even practical to some point. And I still believe a new GPU will be a cool extension to make, although realistically it will take years. And so I am still wondering, is there anything to make my STE more of a wolf to scare some AMIGAs? For the STE, likely a new GPU would be needed such as the one Rodolphe suggested. For the STFM, some extra screen area is possible, but could also hold the same GPU. Considering "past solutions" are basically "dead" ,new solutions is the only way forward. Someone must make a PLCC -> DIL Adapter and the original STE Case do not fit anymore. IngoQ wrote: Yes, I know. What I hoped to find was something that either replaces the builtin shifter (like for example VBXE does for the 8Bit-Ataris) or an independant graphics adapter that is solely usable via a driver and comes with its own RAM and acceleration. We had some discussions about this beeing an option for Exxoss new STE accelerator in this thread http://atari-forum.com/viewtopic.php?f=15&t=29868, but it proves to be quite difficult. Video generation is done in big part by MMU chip - it performs all RAM access, so reading video RAM too. So, only way is with new MMU, faster RAM. It was discussed here already couple times. I don't think that Mega STE VME bus is good idea today. Additionally, it is on same slow ST RAM as any ST, STE. All in all, I think that video expansion is something very big, harder than some CPU accelerator. You need to replace more than half of computer. I remember my first full color PC video card - it was ISA, with slow RAM (1MB video RAM, but cheap simple DRAM). In true color mode was terribly slow. IngoQ wrote: Yes, I know. What I hoped to find was something that either replaces the builtin shifter (like for example VBXE does for the 8Bit-Ataris) or an independant graphics adapter that is solely usable via a driver and comes with its own RAM and acceleration. There is currently only ET4000 based solutions, in the form of an ISA adapter connected to the CPU bus and an ET4000 graphics card. There is no hardware acceleration on these cards, but NovaVDI is pretty efficient stuff so performance is surprisingly good. Both the original and reproduced adapters (VoFa, Nova) use the MegaBus connector, but there are MegaBus-adapters for STE that can be used - if you can find one. The problem is to fit everything inside the stock STE case. There is no way to fit both the adapter and ISA-card inside an original STE. However, if you replace the original PSU with a PicoPSU there is plenty of space for an ISA-card. It requires a lot of fabrication and hacking, but it's doable. I have one inside my own MonSTEr'ed STE. Edit: Here's how it looks. I used an old, broken STFM-case for this project. Last edited by joska on Fri May 26, 2017 11:06 am, edited 2 times in total. Last edited by frank.lukas on Wed May 24, 2017 1:57 pm, edited 1 time in total. This sounds intriguing, but I suspect, as soon as I put Exxos' STE Booster on top of it, my little house of cards will collapse, right? IngoQ wrote: This sounds intriguing, but I suspect, as soon as I put Exxos' STE Booster on top of it, my little house of cards will collapse, right? Of course, when I come to think about it.... wouldn't that be exactly the same as having a booster in a Mega ST and using a ET4000? Does anyone have experience with i.e. a VOFA in combination with a booster? I know people have fitted my booster to the MEGA, but don't think with a gfx card. Though they should work together anyway. Though if the gfx card can take 16mhz input then the booster could easily be adapted. I guess those adapters could latch onto any Atari, and get a AT slot outside the box for a ET-4000 card. exxos wrote: I know people have fitted my booster to the MEGA, but don't think with a gfx card. I have a V1 booster in one of my Megas, and it is working with a Titan Reflex graphics card. But it does not work with my VoFa, if I connect the VoFa the Mega does not boot at all. But as you might remember, the booster did not work out of the box in my Mega but we had to do some changes to the AS (IIRC, it's been a while!) line to make it work. So this could just be my Mega(s). atari66 wrote: I guess those adapters could latch onto any Atari, and get a AT slot outside the box for a ET-4000 card. I always kind of wondered why no one added even the TT resolutions to an STe. Actually what would also be nice (at least for us TT030/Mega STe owners) if there were an outright replacement for the VME bus adapter, something that could make them use more standard things, of course then drivers have to be written, etc. But at least something that could be built as an expansion on boosters for other systems as well. Well, I believe the blitter can still be used, as the framebuffer is within blitter address space. But I don't know if it actually gets used. The performance in 8-bit *is* rather good, similar to what you'd expect from NVDI in 16 colour/4-bit modes. However, while there's twice the amount of data to shift in 8 bit compared to 4 bit, the CPU has to do less work thanks to the ET4000's chunky mode. I just noticed the redraw errors. Random bytes are zero. What kind of setup is this running on? I have noticed the same problem with my VoFa on the STE, but not on the Mega. Happens in both mono and 8-bit. "Der Panther/2-Adapter ist speziell im Hinblick auf Beschleunigerkarten, wie z.B. die PAK68/3 oder Bustakterweiterungen entwickelt worden, so daß hier keine Kompatibilitätsprobleme zu erwarten sind. Natürlich funktioniert der Panther/2 auch 'nur' mit der 68000er Original-CPU." In summary (I'm native in German): the Panther/2 card works with PAK, but can also be used with an original 68000 CPU. You are right the PuPla is a combo, but I was told they also re-engineered the Panther/2 card. So I think it's worth contacting them for a PCB or layout. Panther/2 doesn't work with STE/MSTE as of now. The adressdecoder isn't detected properly. Try it yourself by running P2INT.prg on a machine without a Panther/2. 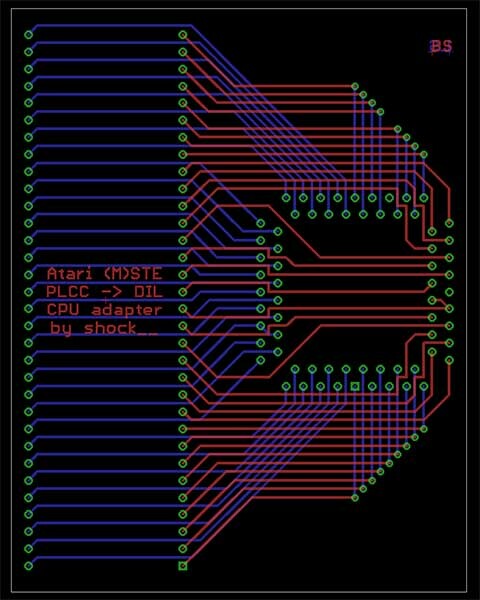 A STE 68k bus adapter already exists and has been built buy Alanh (originally a memory expansion board). It's a daughter board which plugs on the square 68K of the STE, move the 68K Processor and gives a mega bus. I used one to adapt a H&N multiboard on my STE. Those plugin solutions are crap (sorry alanh) ... I have one by GEsoft and it's been the source for a lot of frustration.